UPDATE 01/04/2014 - New updates on e-mail invoice short codes. Please refer the installation section below. Please look out on useful tips which we have included for you to easily customize and install this Blogger e-commerce featured template. Added more search engine friendly best practice settings. Improvements on users sent orders. NOW checks valid emails and security before Sent Order button activates..
Update email invoice plug-in security. New email invoice plug-in host server. License: Creative Commons 3.0 - Free for personal and commercial use. In your Blogger account > Template > Backup/Restore > (Download current template if required) > Choose File > Select the template file in your PC. 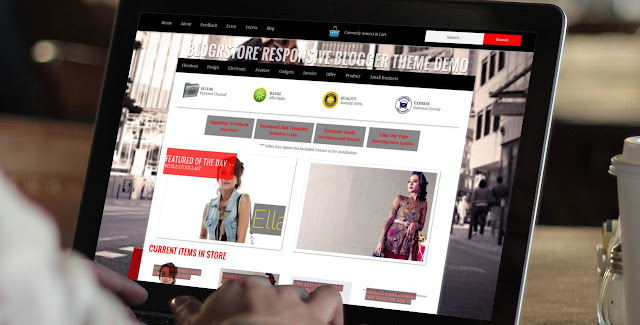 > Upload our BlogrStore Responsive Template file. This is required to automatically build your blog post template and ease your product editing to display with the installed shopping cart plug-in and the automated e-mail invoice. To check if proper installation > go to Posts > Add a new post > A sample product page will be displayed on your new blog post editor. Edit to desire. Tips: Editing your product image is much easier by clicking on an empty space besides the default image which is automatically inserted > click insert image icon > upload your image > select image. After the image successfully loaded > now click the default image > underneath a link will display > select Remove Image (to remove the image). In doing so, your product image will display accordingly (and aligned) in your product gallery pages. Click Publish Page and Click View. Now copy the URL and save it in your favourite text editor. This URL is needed for your custom e-mail data. Tips: You can also customize the look of the SUCCESS page easily by inserting your own texts and graphics. Here, we provide some guidelines to quick start on building your on-line store. Tips: Again, like the SUCCESS page tutorial, you can also customize the look of the ERROR page easily by inserting your own texts and graphics. Here, we provide some guidelines to quick start on builiding your on-line store. <p style="color: #fff;"> Further details will be sent to you automatically via e-mail. We hope you had a great experience here at our store. We look forward for your next visit. Thank You. <p style="color: #fff;"> Please read through on our <a alt="terms and policy" href="/p/terms-and-policy.html"><strong>Terms and Policy</strong></a> for purchase orders submission. All details submitted are kept confidential and will not be published. Now click Save > Save Arrangements. Click View Blog to review your changes. Customize your delivery charges options which yu can find here at our blog. 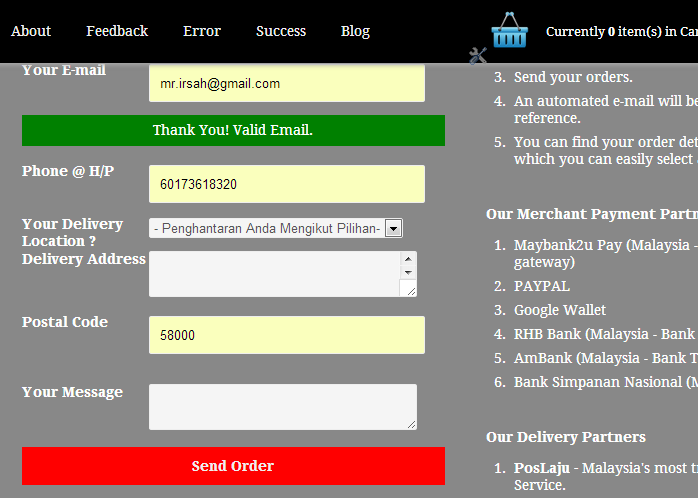 A sample of the checkout form will look like so with the e-mail validation send order button activation. <li>An automated e-mail will be sent to you for your reference. <li>You can find your order details and payment method(s) which you can easily select according to your preference. <li><b>PosLaju -&nbsp;</b>Malaysia's most trusted National Currier Service. Click View Blog to review your changes. Customize your checkout notes and texts here to ease your customer checkout experience. A sample of the checkout notes is given in the above codes example and you can customize accordingly. To customize a label you want to display > Edit at Insert-Your-Label-Here. Please make sure of capitalizations. To customize the amount of posts to be displayed > Edit at max-results=2. Change the integer to the amount of post you require. 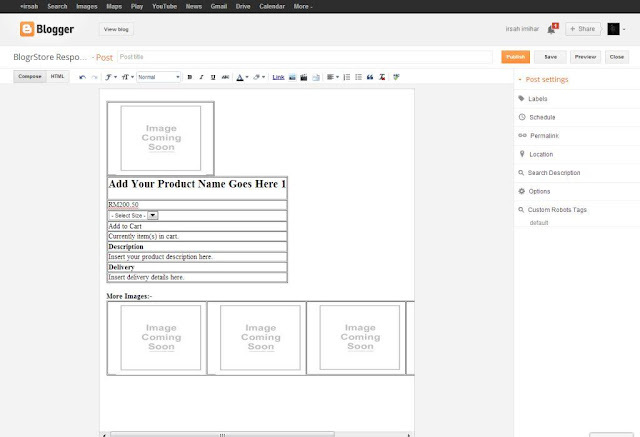 To customize label you want to display > Edit at Insert-Your-Label-Here. Please make sure of capitixzation. To customize the bold text > Edit at <span class="ico-text"><b>BOLD TEXT HERE</b>. To customize the smaller text below the bold text > Edit the texts after the <br /> tags and before the </span> tag. Click save widget > Save Arrangements > preview your blog store for changes. To customize your background image for Homepage > Edit / insert your image link at include-your-image-URL-here. To customize your background image for other pages > Edit / insert your image link at include-your-image-URL-here. Current users can remove the "http:" from your leading url in order to pass through the e-mail validations. The example is as shown above and the listed codes below. Code below has been updated to reflect the changes. We have included indicators for you to customize to your preferences. Please edit in between the " (quotes) section. 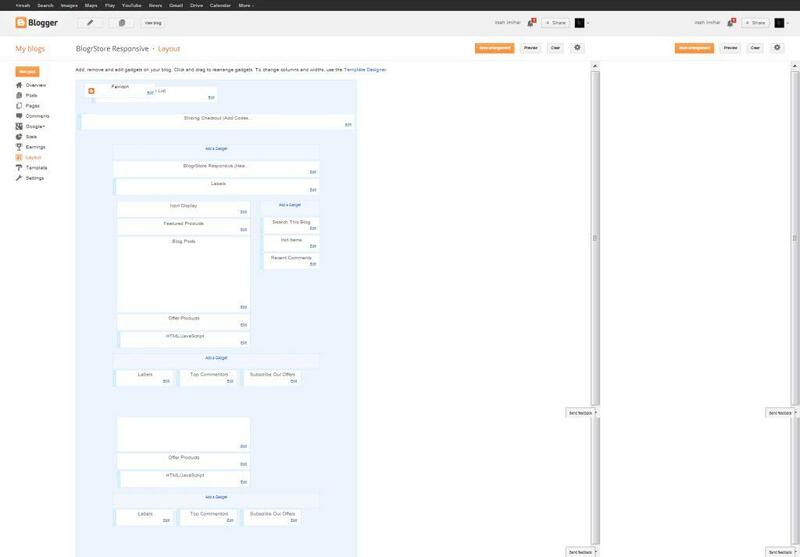 Any changes in the "(quotes) section will be displayed in your custom automated e-mail invoice to your users. Important Tips: Please proof read your codes and changes before testing out you custom checkout from your blog store. If at first launch test, it displays error, DO NOT resend again via your checkout form. Inspect thoroughly on your customizations which also includes missing quotes and commas. The main reason for the ERROR is due to your customizations / installation and NOT because of the template codes provided (via download or tutorial page). Find more shopping cart currency settings, please browse our blog as we have published detailed tutorial on how to customize your shopping cart currency easily according to your country international codes. Within the <apan class='special-featured'>...[codes]...</span> tag change the wordings / sentence to your preference. Within the <span class='special-offers'>...[codes]...</span> tag change the wordings / sentence to your preference. If you have trouble and need more customization guide, including automated select by size options, automated delivery by area charge variants, integrate PAYPAL and auto e-mail invoice feature, more product image display, Blogger pagination issues, sell like nuts with more traffic/visits to your blog store, rank higher in search result pages, we're available for hire, contact us here for more info . You can also find useful tips and tutorials shared by fellow users in our comment sections. please use them as general guidelines for your installation. Some will work and some will not depending on how you set-up you blogger store template. We already provided the tutorial on how to include a recent comment widget which can also be installed in BlogrStore Responsive Blogspot Template V1.1. If somehow you can not find the tutorial right here in our blog, here is the link to the detail tutorial and code snippets http://blog.irsah.com/2013/05/how-install-top-reviews-comments-widget.html . Here's the codes for installing a Recent Commenter widget which uses the default Blogger comments installed in your Blogger Store. Note that we have already included he CSS styles for this widget. You can customize the settings with related indicators included in the codes. 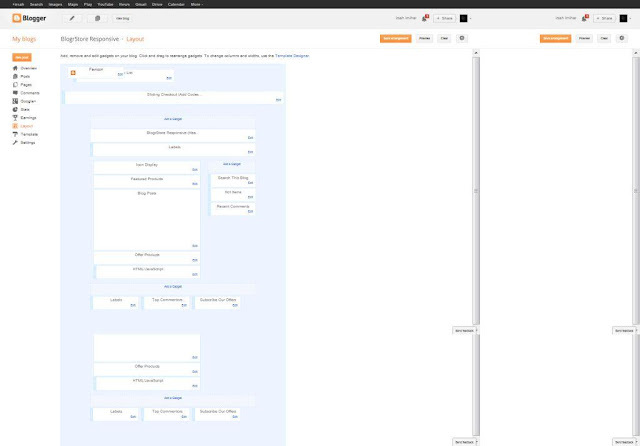 Currentl,y the settings here is similar to the ones used at our DEMO blogshop template. var numDays = 0;            // from how many days (ex. 30), or 0 from "all the time"
Please use our blog search bar to search for related tutorials and codes since that we share a lot of FREE stuffs here for our clients and friends. Happy building.